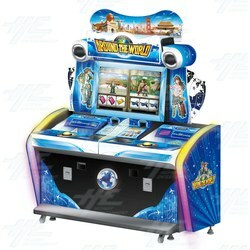 Around the World is a brand new, simple but exciting coin pusher machine from IGS. Featuring a 32inch LCD Screen and a bright, attractive display, Around the World is a sure fire hit to draw in a crowd and increase your cash flow. The main game involves slots like action, with players winning big when they score three of the same picture in a row. Once they have enough points, players can proceed to the four unique mini games - Shooting expert, Wild hunter, Lucky 99, and Panda on Bambo - each featuring its own style of gameplay. The 2 player cabinet features a bright and colourful display with LED lighting and crisp sound. Around the World is a brand new, simple but exciting coin pusher machine from IGS. Featuring a 32inch LCD Screen and a bright, attractive display, Around the World is a sure fire hit to draw in a crowd and increase your cash flow. The main game involves slots like action, with players winning big when they score three of the same picture in a row. Once they have enough points, players can proceed to the four unique mini games - Shooting expert, Wild hunter, Lucky 99, and Panda on Bambo - each featuring its own style of gameplay. The 2 player cabinet features a bright and colourful display with LED lighting and crisp sound.